Beekman1802, online at Beekman1802, is a TV Show, Mercantile, bestselling cookbook and memoir, website and tourism destination all inspired by the Beekman 1802 Farm in Sharon Springs, NY. This one-of-a-kind company consists of 2 guys with the name Beekman owning a goat farm and sharing their experiences with the world. Beekman1802 is a destination with many hidden gems, such as goat cheese, goat soap, food & wine, decor, gardening, blogs about animals, photos, and much much more. Interested in learning more about Beekman1802? Check out RetailSteal.com for all the latest Beekman1802 discounts, Beekman1802 coupon codes, and Beekman1802 promo codes. Enjoy 10% savings on any order when shopping at beekman1802.com. Click here for code. Shop online Beekman1802.com and enjoy up to 55% off sale items. Check out Beekman 1802 and enjoy $5 off your order of $50+ with this coupon code. 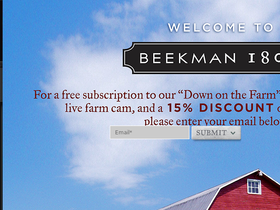 Sign up for an email subscription at Beekman1802 and get 15% off your first order. Also get access to their baby goat cam when signing up. Shop at Beekman1802.com and enjoy a one month cheese subscription for only $50. Click here to shop. Shop at Beekman1802.com and save 20% on the complete set of Minetto bedding bundle. Click here to shop. Visit Beekman1802.com and enjoy goat milk bar soaps for only $15. Choose between Heirloom Rose and Heirloom Violet. Save 15% on your Beekman 1802 purchase with this coupon code!